There's just something so captivating and pretty about a metallic gleam on the eyelid, and how it catches the light in the sun – and bronze is one of those universally flattering shades that looks great on just about anyone. I love it so much that a one-step bronzed metallic eye has been my go-to look this summer – to the detriment of all other seasonal products and trends. It’s ridiculously simple to achieve, too, with any of these four fab products. They’re all easy and effortless but high impact, too: what’s not to love? 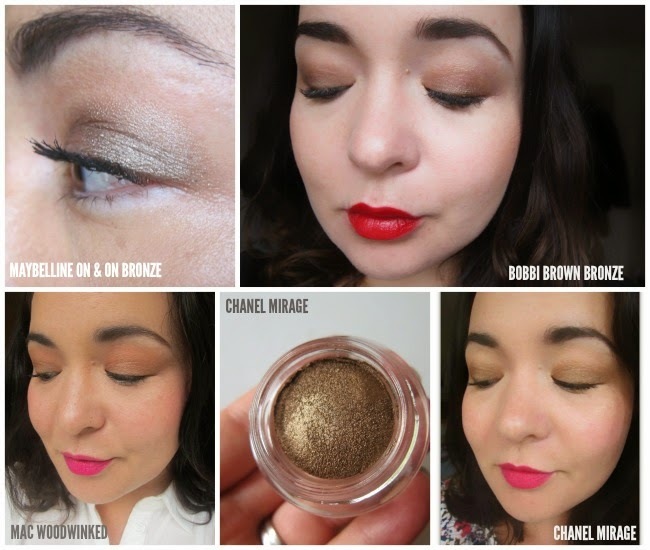 ONE: Chanel’s Illusion D’Ombre in Mirage, €30, is a beautiful, earthy bronze that launched with their summer collection. Like the others I’ve tried in this range, this is fuss-free and can be applied with fingers or a brush for instant prettification. The mousse-like gel formula adheres to the eyelid and really lasts – with zero fall-out. I own about five of these babies but this one is my favourite so far. TWO: Bobbi Brown’s Long Wear Cream Shadow Stick in Bronze, €30, was a limited release with their last Christmas collection, but has since made it into the permanent line – and for that, we should all give thanks. It was perfect for the party season but, with its smudge-proof, long-wearing ways, it also makes a gorgeous, shimmering summer shade. THREE: Cooler toned than the other products featured, Maybelline’s Colour Tattoo in On and On Bronze is an absolute gem of a product; at €10.49, it’s also the most affordable one of the bunch. This gel cream shadow looks the same when I leave work as when I arrived, and the shade is so easy to wear. If you don’t own this already, please buy it – it’s as lovely as it is versatile, and my pot has lasted forever. FOUR: MAC’s Woodwinked is a warm, golden bronze, €16.50, that’s much prettier on the lid than it is in the pan. There’s a little bit of duochrome magic going on: worn alone, or over any of the cream products here, it turns warmer and more coppery at the edges when you blend it out. Which it does beautifully: it’s lovely and buttery to use, and has a flattering sheen that enlivens the face. Metallics are big news for Autumn/Winter, too, so there’s no need to put away your summer shimmers yet. Thanks to Karen, I’m already planning my next bronzed buy – do you have any favourites I should be adding to my list?